Mongrace Montessori House takes special care to help and guide a child during his/her formative years. Please click on these links below to view the Photo Albums and Videos of the various activities that are done in Mongrace Newtown. The Annual Exhibition and Project Display , which is an eagerly awaited event at Mongrace Montessori House and Day Care Centre was held in February, 2014. This year the topic chosen was ‘Celebrations of Joy’. The projects undertaken by the students with the help of their teachers included festivals like Diwali, Ramzan, Holi, Christmas, Chinese New Year, Durga Puja, Dassera. The day care children were motivated to explore ‘More Festivals celebrated in India’ and also some ‘Universal Celebrations’ like Mother’s Day, Children’s Day, Earth Day, Peace Day etc. 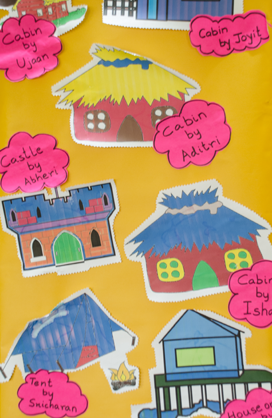 The collective art and craft work undertaken by the children demonstrated application and creativity. Individual colouring activity related to the topic was also on display. The central board which carried the theme ‘Celebrating Diversity-Global Unity’ had pictures of the culturally diverse celebrations at Mongrace. The essence of the display was to help the children understand that by celebrating festivals of different cultures we are promoting Global Unity. The highlight of the display was the true ‘Global’ spirit which was evident in the section where hand written letters sent by children of Uphall School in UK were displayed. This was part of the British Council ‘s ‘Connecting Classrooms’ project of which Mongrace Newtown has been a part of. We had sent the students of Up Hall School online cards and a video wishing them for Christmas and they in turn surprised us with the letters of their celebrations as part of their contribution to our project. The excellent presentation was a pointer to the high standards set at Mongrace Montessori House and Day Care Centre. Kudos to the Mongrace team at Newtown, who have proved time and again that their endeavour to work towards excellence is ceaseless and untiring!! Durga Puja celebrations was very special at Mongrace Montessori House and Day Care Centre, Newtown as we observed the JOY OF GIVING week on the days 2nd-8th October. Children brought gifts for friends who were not as lucky as them. On 8th we had a pre- Puja party to which we invited children from the SOS village and they too were part of our celebrations. It was pure joy to see the smiles on the children’s faces and to see them match steps and be part of the celebrations. We shared the gifts with children at the SOS village and felt happy that we were able to spread joy! This was an activity on September 19th by the Mongrace Montessori House and Day Care Centre. The activity provided opportunities for children to become aware of becoming young responsible citizens as it focused on conservation as a way of life. Teachers’ Day was celebrated on 5th September and keeping in mind the topic of the week, which was flowers, we had an activity ‘I am a flower in my teacher’s garden’. There was an interactive programme, with kids and teachers performing for one another. The essence of the programme was to help the children wish their teachers on this special day and thank them for their love and support. The song ‘Teachers you are special' sung by the children made them feel very special. On 31st August, Dr. Rochita Mukerjee conducted a workshop on ‘Helping teachers identify Special children’ and ‘Building self esteem in children’. The Auxiliary staff were also counseled on being sensitive to the emotional needs of the child. As an extension of the topic Land transport, there was an activity ‘Safety on the road‘. A Zebra Crossing was created for this using a plastic sheet . Through role play and games children were made to understand the importance of being safe on the road. Children had fun as they loved the game which was the test to see if the concept was clear!